On 10 January 1969, the media was shown the new Triumph TR6 sports car at Canley. The event was hosted by George Turnbull, Cliff Swindle and Spen King. They apologised for the absence of Lord Stokes, who was suffering from influenza. Turnbull added: ‘Accordingly, all our pre-announcement production has been thus far entirely devoted to left-hand-drive cars so that we can support the launch of the new TR6 in the United States and at the Brussels Motor Show next week. Cliff Swindle told the press that Standard-Triumph had manufactured 139,000 vehicles in 1968, 14 per cent more than in 1967. Swindle went on to say: ‘We have had a splendid year in overseas markets with the USA, and Western Europe being the star performers. To the USA we have shipped nearly 19,000 units, over 70 per cent more than in 1967, while in Europe sales have increased by 27 per cent to over 25,000 units. ‘A great contribution to our success in Europe has been made by the Leyland-Triumph plant at Malines, near Brussels. This produced more that 12,000 vehicles during the year and is now moving towards an annual production rate of 17 per cent of vehicles as a result of expanded and improved production facilities…. Spen King then went on to describe the differences between the TR5 and the new TR6: ‘The main features of the TR6 PI which distinguish it from the TR5 are immediately clear. ‘The body has been extensively re-styled by Karmann-Ghia and this has been done while still using a number of panels – mainly interior ones – common to the TR5. The overall effect achieved is more modern and elegant. The doors and windscreen were still taken straight from the TR4, as were the underpinnings. Wider wheels were fitted, and were steel as standard, with stylish chrome trim rings to maintain the exclusive look. Inside, the seats were given a little extra padding, but under the bonnet things continued as with the TR5/TR250, with fuel injection and 150bhp for most of the world and 104bhp with carburettors for the USA. 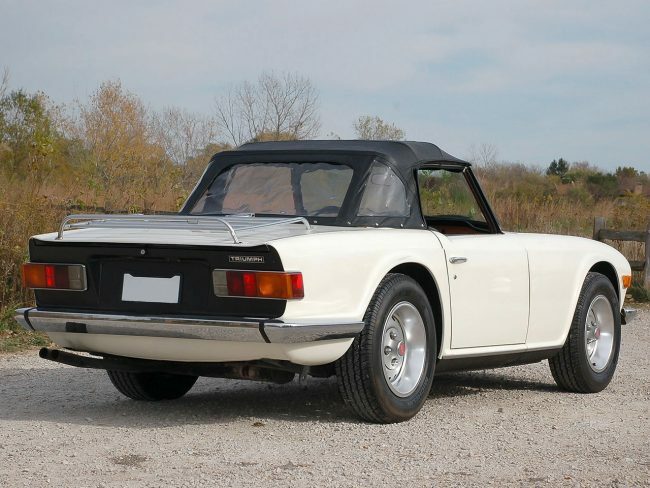 The TR6 remained unchanged until 1976, when the TR7 was rushed in to replace it, but the relationship between the two cars was limited to the TR name only – there were no carry-over parts. 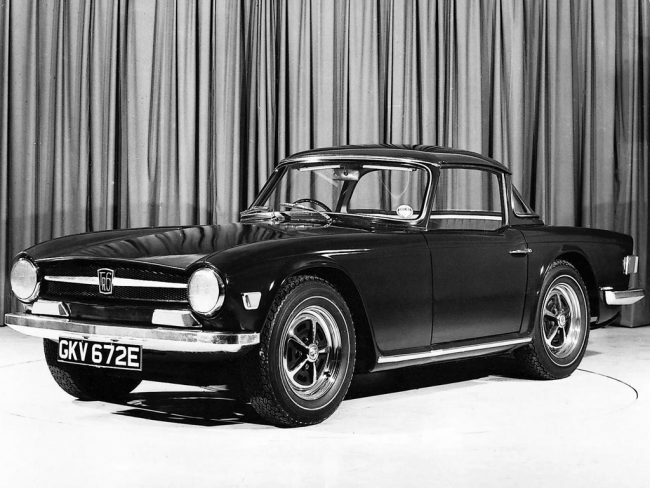 The TR6 was officially announced on 14 January 1969. As James May said on Top Gear, there was no need to ever replace this car. It could have just been updated over the years. It is the perfect incarnation of what a British Sports Car should be. Think of the body with a modern engine, air bags, ABS and improved suspension. Sounds good, Alfa Romeo managed to keep the Spyder in production until the 1990s, even with a messier front end. The Stag or Rover V8 would have been a nice addition too. Basically, isn’t that exactly what Triumph had already been doing? TRs 6, 5, 4 and 3 were all largely based upon their predecessors and thus ultimately descendants from the 1953 TR2. Hard to imagine that this base could have served another 20 years, though. Except that under the TR6’s Karmann makeover, there were still an old – world separate chassis and body. Whereas, mass – produced contemporaries like the MGB or Alfa Spyder all had unitary bodies. With this underlying architecture, the TR family had no further future, in terms of meeting future requirments for crash worthiness, general structural integrity, and ride / handling qualities. Specialist competitors like TVR did of course continue with separate chassis and fibreglass bodywork, but with far more scientifically designed, and expensive to build, space frame chassis. The Spitfire managed to last until 1980 using almost the same chassis that started out in the Standard 8.
the very car in the photo, GKV 672E, was featured on one of the magazines not long – ago.